What happened in Boston on Monday was a tragedy, and a complete act of terrorism by the Tsarnaev brothers, and believe me I’m glad they got the one and I hope they find the other brother. However there has always been something I’ve hated, that occurs around every large event like this, or even the fertilizer explosion in Texas. I hate it when the news organizations try use pathos, and play off peoples emotions, and blow stories right out of the water. The one article I read to day, was putting a significant amount of emphasis on the date on which one of the brothers became a US Citizen. So what if he became a citizen last year on September 11th, in honesty, that would our fault, because we schedule the tests. Or take the explosion in Texas for example, as soon as it occurred, every news corporation was reporting that the explosion was related in some way to the Boston bombing. Come on people factories blowup, and unfortunately this one took the lives of many. Today I read an article that stated that the fertilizer was storing the explosive ammonium nitrate. Yes they would be storing this, because its a fertilizer, its not an explosive until it’s mixed with fuel oil. The article made it seem as though the owners of the plant were hiding a bomb. I don’t no why I bother to watch the news any more. 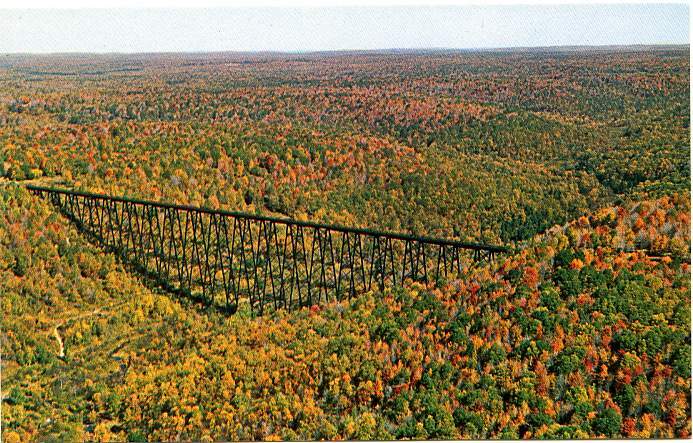 This entry was posted in RCL on April 19, 2013 by William Chittester. Though many feel that the possibility of a tornado to occur in Pennsylvania is almost nonexistent, nothing could be further from the truth. Depending on where you are in the State of PA you could be in the tornado alley of Pennsylvania. The primary locations in which tornadoes occur tend to be in North Western, South Western, and South Eastern regions of our state. 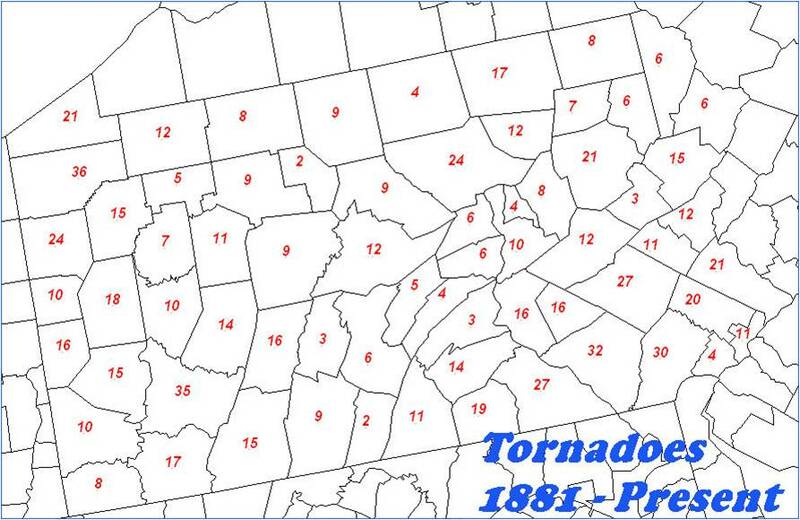 Counties such as Crawford, Westmoreland, and Lancaster have all experienced in excess of thirty tornadoes since 1881. 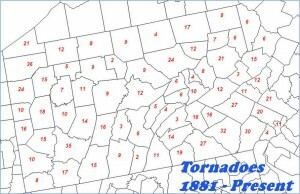 Back on May 31st 1985, the state of Pennsylvania was the epicenter of a severe tornado outbreak, the deadliest in our state’s history. In total, 43 tornadoes touched down including eight F4 tornadoes, one of which went through the state forest to our north, and a F5 tornado in the Sharon PA area, that decimated the town of Wheatland PA.
As you can see from the satellite loop, the storms really develop towards the end of the loop, which was the late afternoon on May 31st. The timing was one of the key factors in the number of people killed, because the morning was beautiful so many people went outside to enjoy the day, with tornadoes being the last thing on their mind. In the end 88 people lost there lives. 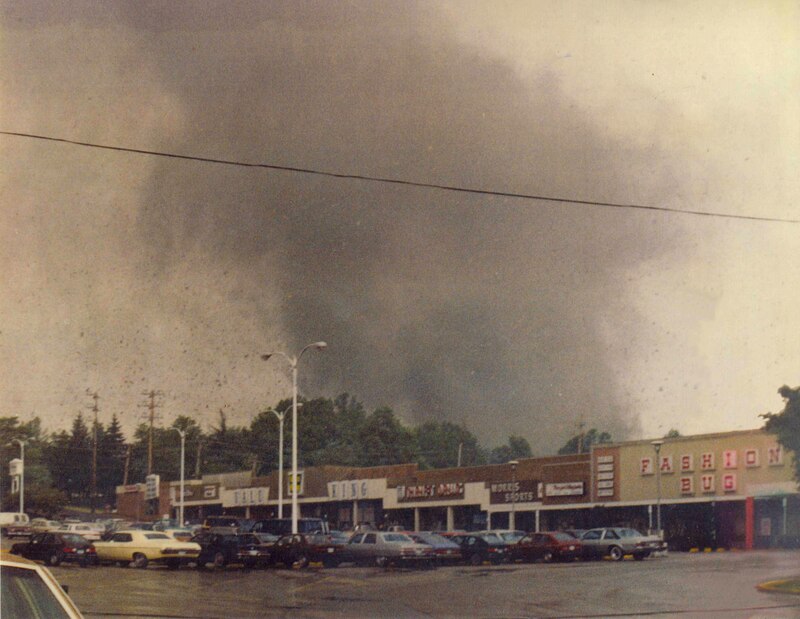 Worst of them all occurred in Mercer county and destroyed the town of Wheatland PA. At approximately 6:30pm the F5 tornado touched down outside of Niles OH, and continued across the PA/OH border in to the Sharon area. Leaving 18 people dead and over 300 injured. In the end, May 31st 1985 will always stand out, as one of the deadliest days in weather history for the State of Pennsylvania, and even though I enjoy this kind of weather, we will most likely never see such a day again, on this day everything was perfect for the development of this outbreak, and it would be rare to see this happen again. Tornado paths during the Outbreak. Have a great summer and always be aware of your surroundings, and stay one step a head of what ever weather you might experience. This entry was posted in Will's World Wide Weather on April 19, 2013 by William Chittester. The movie Amistad was produced by Steven Spielberg, and told the story of a group of Africans, and there fight for freedom after causing a mutiny aboard the La Amistad, and being brought to the US to be tried on murder charges. Through out the film Spielberg make us of pathos, to challenge our on freedom and make us feel a connection between the African’s fight, and our own fight for freedom. There is one scene in the movie in which shows one of the characters, Cinque begs for freedom while in the courthouse. This establishes Cinque’s ethos, due to his use of English, which sets him apart from the rest of the group and really established him as the leader of the group due to his intelligence. During many of the court scenes pathos was used by the lawyers for the Africans, to win over the judge. One such example is John Adam’s speech about the true meaning of freedom. This entry was posted in Uncategorized on April 12, 2013 by William Chittester. So this week I will be beginning multipart seris on severe weather. It wont be about the usual, lightning and so on, however more uncommonly seen severe weather such as this weeks topic of a Micro Burst. Of all the forms of severe weather, such as tornadoes, lightning, and hail, it might be hard to believe, but wind is the most deadly of all of these forces. More people are killed by wind than tornadoes every year. 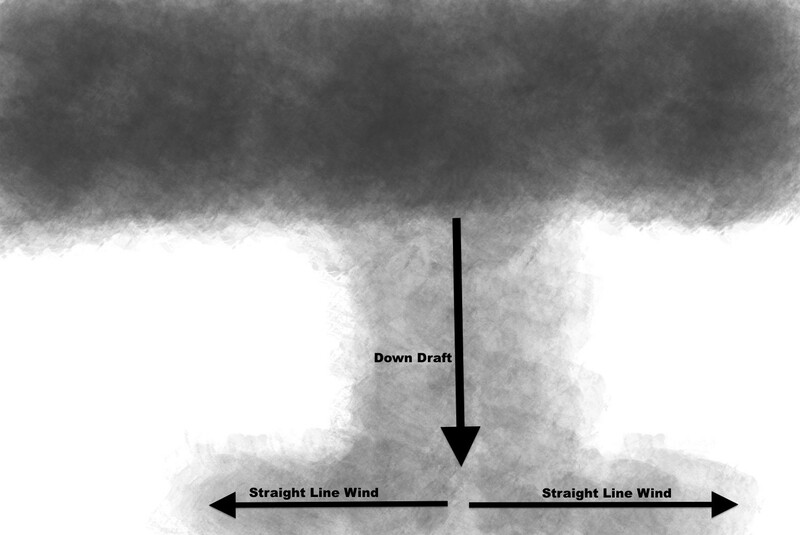 Whether it is straight line wind from a thunderstorm or a microburst, wind is the real killer. 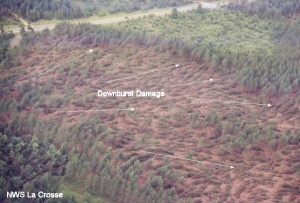 Of all wind related events, none is more sever than that of a microburst. A Microburst is essentially a rapidly descending column of air, also known as a downdraft, the forms at the base of a thunderstorm super cell. 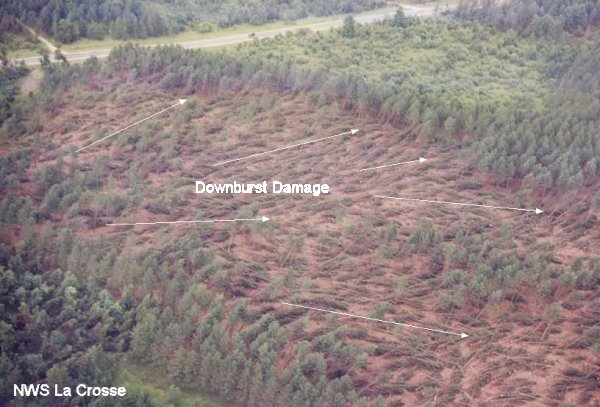 These straight line wind make determining whether or not the event was a tornado or mircoburst fairly easy, because all the damage is blown out from a single location. Though it is still debatable whether it was a tornado or a micro burst, a micro burst was possibly responsible for taking down one of Northwest Pennsylvania’s most historical sites. 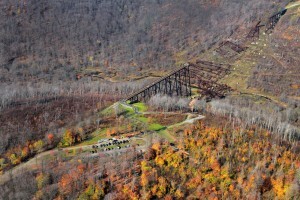 The Kinzua bridge, once the tallest railroad bridge in the US and at one time the world. This entry was posted in Will's World Wide Weather on April 12, 2013 by William Chittester. As we all know, recent relations with North Korea have continued to decrease and it seems that our world is on the brink of another war. One wrong step by either side could start this conflict. When I watch the propaganda films produced by North Korea I can’t help but think of the lack of logos to their whole argument. They seem to be solely running off of the pathos of it’s leader, and his feelings on how he thinks his military is feelings. But in the end no matter how much propaganda the produce, don’t feel that it will change the way we ultimately look at North Korea. This past week I was watching an episode of Sponge Bob with some friends in my dorm, and this episode summed up the current North Korean conflict, fairly well. This entry was posted in RCL on April 5, 2013 by William Chittester. In the map above, you can clearly see the currently the state of Pennsylvania is standing out like a sore thumb. Why is that? Its because currently as you read this the state of Pa is under what is know as a red flag warning, which means there is an extreme risk of rapidly spreading wildfires. 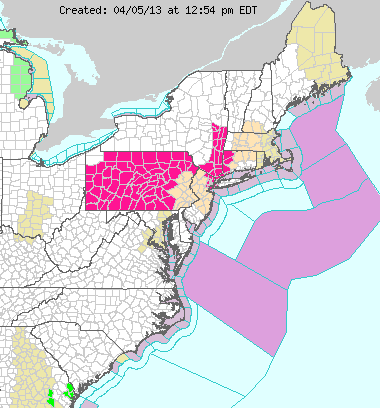 So if this is about just the possibility of forest fires, why is the Nation Weather Service in charge of issuing these Red Flag Warnings? Actually the Nation Weather service has a lot of say when red flag warnings are issues, because they are truly a fire weather warning. 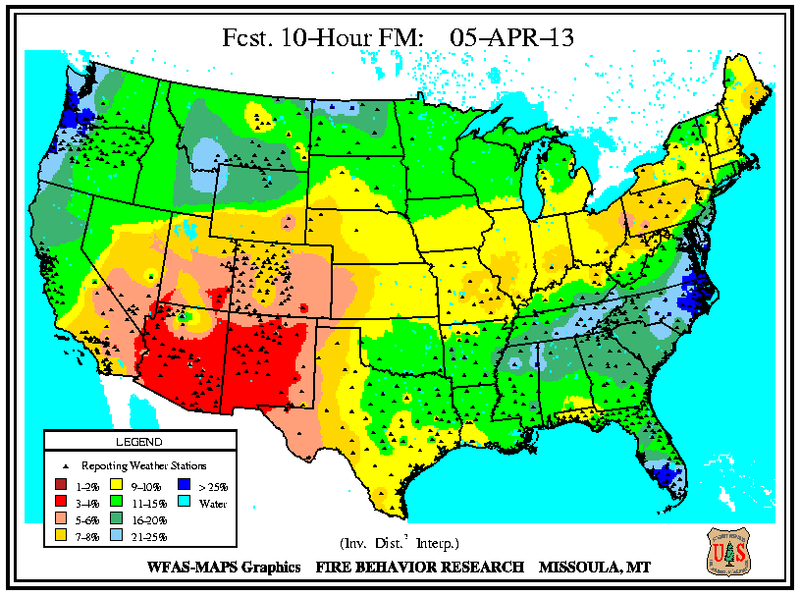 Fire weather is a combination of many factors the increase the potential for wild fire growth. Typical it consists of a low relative humidity “The amount of moisture in the are” and also the speed of the wind for that day. When there is a low relative humidity, more of the moisture contain within the fuel for a wild fire evaporates causing it to be more combustable. The higher the wind speeds, the quicker the wild fire can spread. 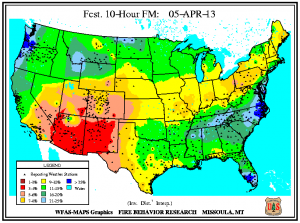 So with dry fuel and high wind, the potential exists for a large forest fire. This is one side of meteorology Im very interested in and would like to pursue. This map show the current percentage of moisture in the fuel for a fire, as you can see the State College area is between 5-8% so the fuels are extremely dry. This entry was posted in Will's World Wide Weather on April 5, 2013 by William Chittester. In the movie Network, by Sidney Lument, Howard Beale a fired TV news reporter has the opportunity to return to TV and host a show about how everyone feels about the current situation of the United States during the 1970’s. One the first night of the show, he gives a speech, which in turn causes tons of people around the US to follow his direction and yell “I’m mad as hell and I’m not going to take it any more”. So what caused his speech to empower so many to follow him blindly? It boils down to the main subject and his use of pathos, to relate to the feelings of the majority of Americans during this time period. He appeals to people’s desperation for answers to the problems of the 1970’s, and these people see Howard as a person who is also suffering from the same issues as the common American. Finch, Peter, perf. Network. Metro-Goldwyn-Mayer, 1976. Film. This entry was posted in RCL on March 29, 2013 by William Chittester. The question that has many wondering, Where is Spring? Unfortunately it is truly no where to be found, since this weekend and next week we will most likely staying in the mid forties to lower fifths. Though its not the sixty or seventy degrees that we all wish would occur, we will have to live. 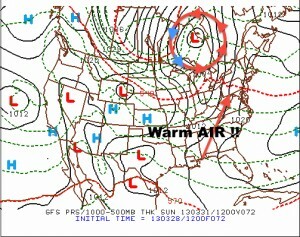 There will be a slight trough of lower pressure that will bring warmer temperature a head of some rain on Sunday Night. Unfortunately it’s not to last however, Sunday night we might see the return of precipitation, in the form of rain both Sunday night and through the beginning of the week, at least it should mainly be rain. But as we all know, here in State College, you never know what might happen. This entry was posted in Will's World Wide Weather on March 29, 2013 by William Chittester. The movie we watched this week in COMM 150, was 2001 a Space Odyssey by Stanley Kubrick. Of all of the movies we have seen this semester, Space Odyssey was the only one to cause me to leave the State Theater in complete confusion. Kubrick’s idea’s were very effective in causing his audience to really think about what he felt was the true meaning of the movie, since this was never truly stated. One quote from the production crew summed this up, “If you understand 2001, then we have failed”. Of the whole movie, the last scene really leaves the most to be questioned, as to what is the symbolism in which Kubrick is trying to portray? This entry was posted in RCL on March 22, 2013 by William Chittester. This week in weather history, marks the one of the first scientific attempts, to control the weather. During this week in the 1950’s, New York City was continuing to suffer from a severe drought. Most of the cities water reservoirs had begun to dry up and the use of water was being strictly reserved. Thats when New York City hired meteorologist Wallace E Howell, who had developed a process of making artificial snow, to come to New York City and make it rain (Fountain). Wallace used a process that involved using dry ice and iodine, to create nuclei for water droplets to form, he called this process, cloud seeding(Fountain). According to many, they felt that the process was working, multiple newspapers reported storm clouds, rain, and even a snowstorm in April (Fountain). At the end of his contract the reservoirs for NYC were back to normal levels. There is still great doubt, and lack of scientific evidence, wether or not the rain was truly caused by Wallace. The idea of weather modification still exist today, but with the purpose of trying to stop severe weather, such as dumping liquid nitrogen in the ocean to starve a hurricane of warm water. I personally feel that we should just let nature run its course. Punxsutawney Phil has been indicted by the county of Butler Ohio on the charge of misleading the nation into believing the spring was coming early. Fountain, Henry. “Wallace E. Howell, 84, Dies; Famed Rainmaker in Drought.” The New York Times. The New York Times, 06 July 1999. Web. 22 Mar. 2013. <http://www.nytimes.com/1999/07/06/nyregion/wallace-e-howell-84-dies-famed-rainmaker-in-drought.html>. This entry was posted in Will's World Wide Weather on March 22, 2013 by William Chittester. This week’s parting thoughts in my COMM 150 course was about how we American’s believe the total amount of wealth is distributed in the United States. To me this video was eye opening, I knew that America had a distribution problem, but I never would have thought it to be this large. The really reason that this video gets its point across is the fact that it puts visuals to good use. The graphs and charts he uses clearly convey his message of the true problem America has. Personally I feel that it is unacceptable for the top one percent of the US to have 40% of our wealth, compared to every one else’s 7%. In the end this video I feel that this video is very effective towards getting you to think about the problem of wealth here in the United States. This entry was posted in RCL on March 15, 2013 by William Chittester. Weather models have been in the news recently, and the US weather model has been under fire for the reasons that it seems as though the European Weather Model is out doing the US model and is predicting the weather more accurately. There are many reasons behind this, but first lets cover all of the different models used by meteorologists, since there are so many to choose from. Many different countries put out dedicated weather models. The US has then North American Model abbreviated, “NAM”and the Global Forecast System “GFS”. Canada produces the Canadian Model “CMC”, a Europe as a whole uses the European Model, “Euro”. Finally there are the independent models such as Accuweather’s Galileo. All very different models that try to convey what their data is saying the weather will be. So what makes for a good weather model? In the realm of weather models, it’s all about resolution. The more location data points the models uses the better the resolution and the clarity of what the model is predicting. 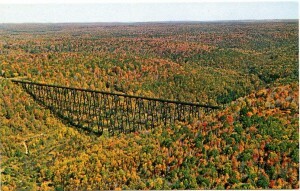 The internal computer system that runs the model is also a large factor. This is where the US model fails. For many years the US weather models were left unchanged, while the European Model continued to advance with technology. This is why the Euro out performs the NAM. However the National Weather Service is addressing these issues, and plans on updating the US models in the near future. So some day the United State might once again be on the top for weather forecasting. This entry was posted in Will's World Wide Weather on March 15, 2013 by William Chittester. This past weekend, I was lucky enough to be able to attend the Bon Jovi concert at the Bryce Jordan Centre, or Bon Jovi Centre as it was called that night. Bon Jovi played a few singles from his brand new album, “What About Now”. Of all the songs he sang there was one that really stood out to me, because it really summed up how I felt during the day. The chorus to “Because We Can” really reflects the attitudes of many Penn State Students on State Patty’s Day. Many students were not another wave in the ocean, we were all rocks. Instead of going out and drinking all day long, we took a stand and help our community thorough the many service project offered by State Day of Service. From students picking up trash, to cleaning brush at the arboretum, the community of State College will always have a someone they can rely on. This entry was posted in RCL on March 1, 2013 by William Chittester. This spring break is going to be really neat spring break depending on where you decide to give if you are traveling to a typically spring break vacation locations like the Outer Banks in North Carolina. The Outer Banks next week actually has the potential to see some snow. 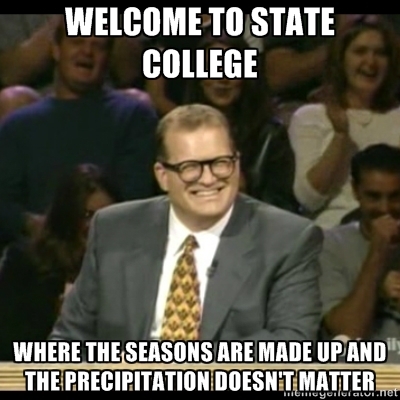 Which I find really ironic because many people tend to travel there to get away from the weather around here. A prime example of this is the fact that my special living option, The Earth and Mineral Science House, will be traveling to the Outer Banks as a house trip. I on the other hand will not be attending. So I wish everyone safe travels to where every you many be going. In other news. You may or may not have heard, that today is officially the first day of meteorological spring. So what is the main difference between spring and meteorological spring you may ask? Well as you may know spring is caused by our location in relation to the tilt of the Earth’s axis. In the meteorological world however, it all has to do with temperatures. Meteorologists break down every season into three month time intervals, and these time intervals are determined by the mean temp for that time. So for the next three months we should see gradually increasing average temps, in the end leading to meteorological summer. Many of the weather models we use on a daily basis are starting to indicate some sort of winter storm that will hit the East Coast in the middle of next week. Here is a possible snow fall accumulation map, from the State College National Weather Service. This entry was posted in Will's World Wide Weather on March 1, 2013 by William Chittester. Today, at around the same time our class starts, the Harlem Shake should be hitting the Penn State campus on a large scale. Today a large group of people will be meeting on the Old Main lawn to create the first Penn State Harlem Shake to occur with a large group. What’s unique about the whole Harlem Shake phenomenon, is the fact that the original video in which the song debut, was uploaded to youtube over a year ago. So why is it just the Harlem Shake just taking off now? This seems to happen all of the time, someone will upload a video, and for a year or so, it will sit there and barley get any view. The video doesn’t go viral until someone spreads it, and thanks to social media this happens very quickly. This entry was posted in RCL on February 22, 2013 by William Chittester. Since today we have the possibility of experiencing some freezing rain later this evening and into the overnight hours, I felt that today would be a good day to cover how freezing rain occurs and what conditions are necessary in order to get freezing rain. In the above image, it shows the temperatures here in State College this morning. The black line represents the 0* C line and the red line is the actual temp. In this case all of the red line is to the left of the 0 C line, so in this case we would get just snow. 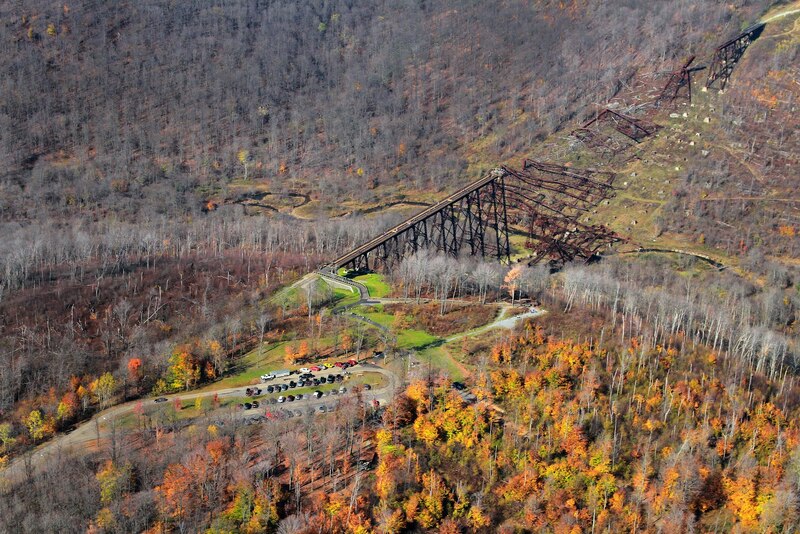 If we look farther to the west however in Dubois PA, we see something different. If you follow the red line down, just above the ground, it crosses the 0 C line, then back to its left. This means, as a snow flake falls from the upper atmosphere just above the ground it melts, but at the ground surface it freezes again, so hence the term freezing rain. This entry was posted in Will's World Wide Weather on February 22, 2013 by William Chittester. So this semester I’m taking a gen ed in art, in this case it’s communications 150 which is the art of cinema. Honestly the class is fairly interesting, however it’s not the movies we have watch or the techniques we have learned about in the making of the a movie, but the professor himself. My professor is a very opinionated individual, and at the end of class every thursday, he shows us what he call his parting thought. His parting thoughts are generally in the for of a montage of video clips from the movie we watched that week and current issues we are facing in our country. This week we had watch a movie dealing with mob controlled unions. His parting thought talked about how Americans today have no collective bargaining rights, and that what held people together in the work place, unions, are being destroyed by the republicans, who are portraying unions as evil. My mom being a school teacher, I am fairly familiar with how unions work, and I would have to agree with my professor that unions are an important part of a developed countries work force. Without a union workers would have almost no say in their safety, or other aspects of their employment. There would also be no force to fight back when issues are occurring. I feel unions serve an important role, and they should be preserved. This entry was posted in RCL on February 15, 2013 by William Chittester. 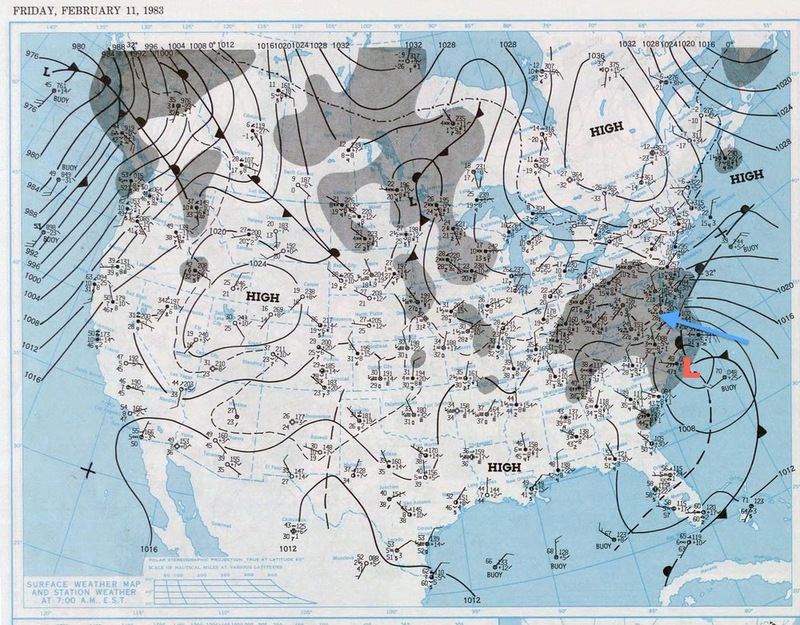 The week of February 10th through the 15th is a fairly important part of weather history, during this week back in 1983 there was a major blizzard that hit Washington DC, and south central Pennsylvania. In 2007 there was also a major blizzard that brought more than twenty inches of snow to some areas in New England, but also caused a tornado outbreak in southern United States. 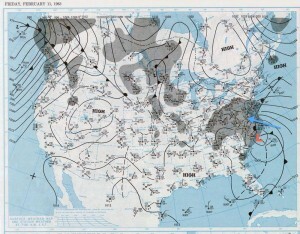 The 1983 storm occurred between the dates of February 10th through the 12th and brought snow fall amounts of nearly three feet in some places to the south of Pennsylvania including Washington DC. On the night of the 10th of February, there was a strong area of low pressure of the Georgian coast. 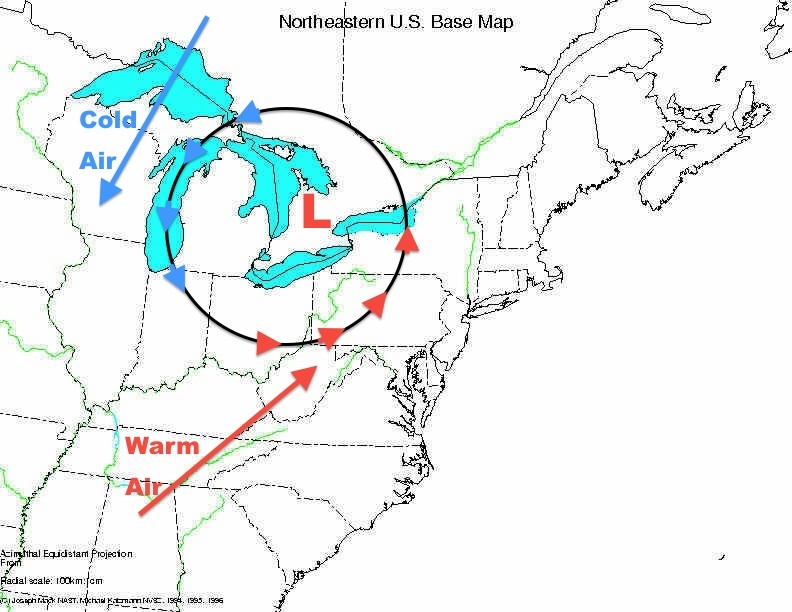 As I said in an earlier blog, air around the low circulates counterclockwise, which brought moist air of the cold ground in the DC area which was the primary cause of the snow. 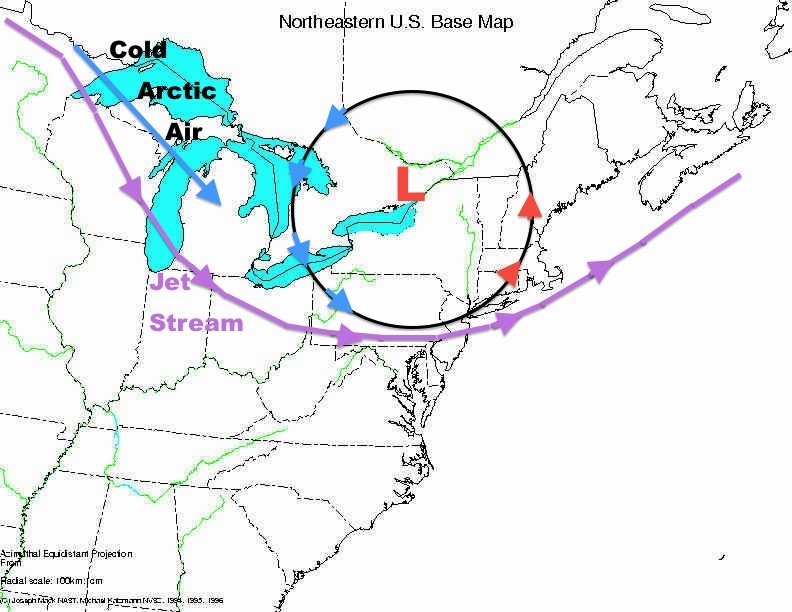 Back in 2007 however, the blizzard know as the Valentines day blizzard, formed much differently due to the fact that it was a low pressure system that moved in from the western coast. This in turn caused the snow to be centered around the New England region. 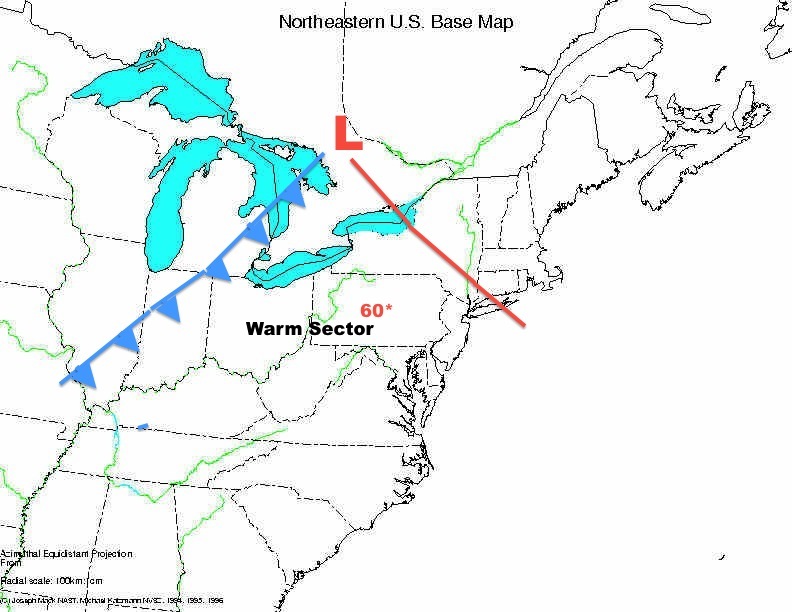 Coming from the west also caused this system to produce tornado storms in the south, due to the cold dry air meeting warm moist air from the Gulf of Mexico. So from a blizzard in 1983, a blizzard and severe weather in 2007, to the surprise snow storm on Wednesday, with the best packing snow ever, this week in February in truly unique. This entry was posted in Will's World Wide Weather on February 15, 2013 by William Chittester. Of all of the Super Bowl commercials that aired this year, the one which I felt was the best out of all of them, was the Volkswagen commercial. Overall the commercial was very believable and it was easy for those who watched it to relate it to their actually life. Which is something you can’t say for some of the other commercials, such as the Axe Astronaut, or the Wheat Thins commercial with the yeti. From the very start of the commercial where the office employees state “I hate Mondays”, to the food stuck in the vending machine, I’m sure at some point in time each of these scenes has happened to someone somewhere. I really enjoy any commercial that is relatable to the aspects of my life. This entry was posted in RCL on February 8, 2013 by William Chittester. So if you have watch the Weather Channel at all lately, you’ll see the almost 24 hour coverage of what the Weather Channel is calling Winter Storm Nemo. This storm is of a Noreaster type, which means it is traveling up the Eastern seaboard and heading directly for the New England states. What, makes this storm different however? In this case, there was a low pressure system moving across the country from the west which is merging with the Noreaster. The combination of the two will bring heavy snow fall to places like Boston and New York City. The storm has the possibility of setting some record snowfall in some locations. 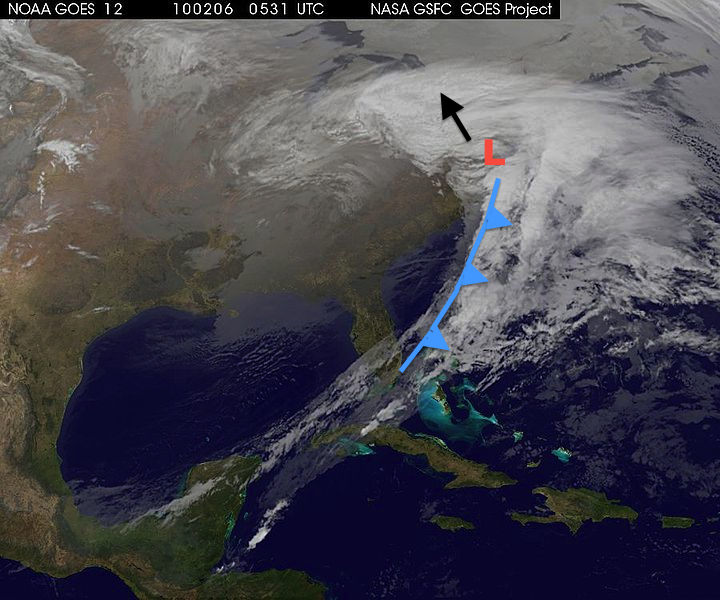 The low to the left is the system that came from the west and the one on the right is the Noreaster. Three years ago on this same weekend the US was affected by another Noreaster, the North American Blizzard of 2010. 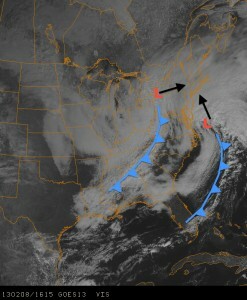 The current storm is following the same approximate path as the blizzard in 2010. The main difference between the two is the fact that the current storm contains the extra low pressure system. This entry was posted in Will's World Wide Weather on February 8, 2013 by William Chittester. So this week was one of the most unique weeks yet in my time here at Penn State so far. Starting the week with freezing rain on Monday, followed by a nice sneak peek of spring on Wednesday, and finally lake effect snow with arctic temperatures to close the week. 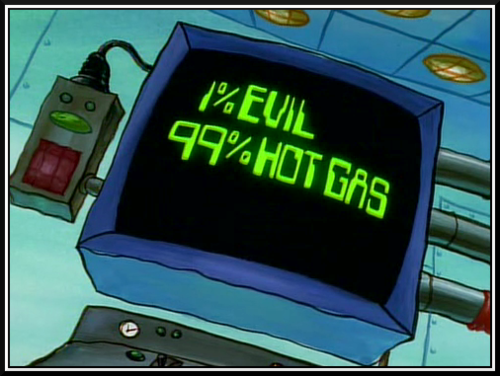 So here is a description of what caused us to have such a weird weather week. 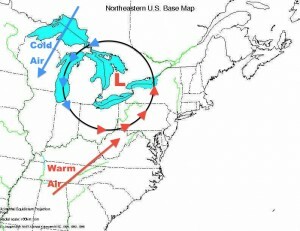 A warm sector is caused by the rotation of air around the center of low pressure. 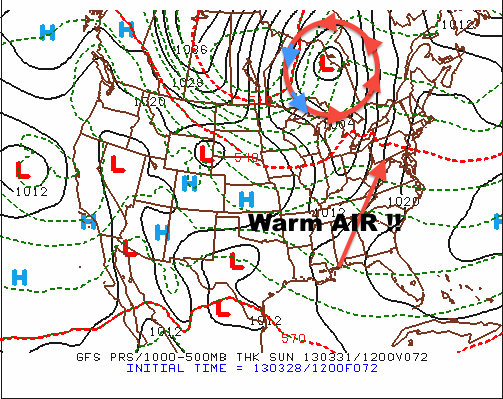 As the air rotates counter clockwise around the low, it draws warm moist air from the Gulf of Mexico which gave us temperature in the upper 50’s. Just past 9pm on Wednesday, the cold front past through Pennsylvania, and are temperatures began to drop steadily, and they are still dropping. By 8am Thursday morning we were at 30 degrees. So what caused the snow on Thursday? Remember that the air around the centre of low pressure rotates counter clockwise, so after the low moved to our east, this brought cold air from the north. This cold air moved across the warmer moist air above the great lakes, which caused us to get the lake effect snow we saw on Thursday. 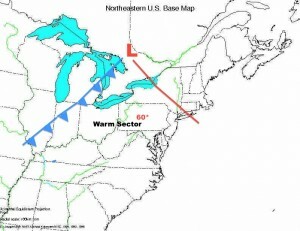 In the map image above, you can see that the jet stream curves down from the north and travels through our area. This is going to bring the return of cold temperatures for next week, so bundle up. Blank US map by Northern Arizona University, Department of Geography. This entry was posted in Will's World Wide Weather on February 1, 2013 by William Chittester. When I look at this image, there are multiple items that stand out to me. First would be the contrast between the ground and the storm in the sky, clearly the sun is behind the photographer, but the contrast to me has a symbolic meaning. The dark storm represents the ominous feeling of the destruction that is soon to happen. 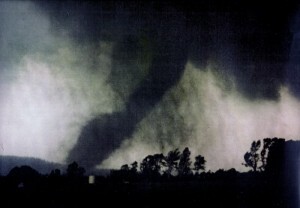 The light foreground is symbolic of the peaceful tranquility that commonly follow a tornado. Finally, we have the tornado verse the rainbow. 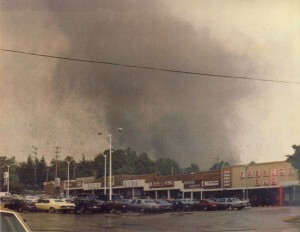 For many, the tornado would represent the ugliness behind this event, the sheer destructive device that is capable of leveling whole cities and town, causing fear to be the first thought on people’s minds. 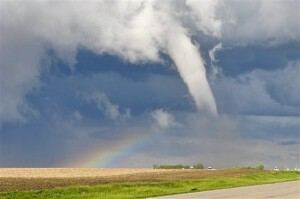 For me however, the rainbow is what represents my thoughts about tornadoes. I see this tornado for its beauty, and mystery it presents to my choice of major, and my longing to fully understand them. This entry was posted in RCL on January 25, 2013 by William Chittester. Welcome to WordPress at TLT Labs. This is your first post. Edit or delete it, then start blogging! This entry was posted in Uncategorized on January 18, 2013 by William Chittester.